The Truth Team has decided to work from home today. We didn't want to even give Metra a chance to let us down by having delays and being a total mess. Metra will tell you that the problems that will inevitably occur today are totally out of their control. The old "You know Mother Nature" line. But, that's just crazy talk. There's something *broken* with Metra. And those of us who live in the suburbs need a healthy, productive, reliable Metra to be able to get to work each day. 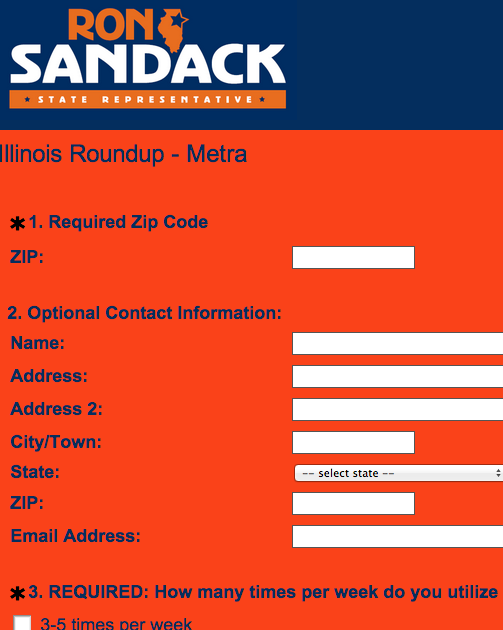 There's one guy who's trying to get to the bottom of the problem and that's State Representative Ron Sandack. From day one, he's been all over Metra. He's the guy who has called Metra on the carpet in the form of legislative hearings. His District - centered around Downers Grove on the BNSF line - is ground zero for Metra riders and (lately) the complaints and issues around weather-related delays. Ron Sandack is gathering your input on how you - the folks who help fund Metra as taxpayers - feel about the service. He's put up a survey. You can find the survey here.